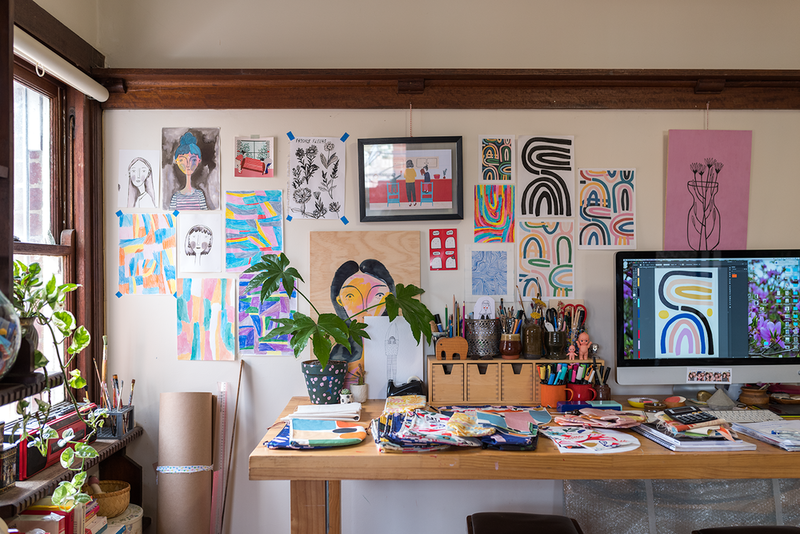 Claire Ritchie in her home studio. Photo © Susan Fitzgerald 2017. 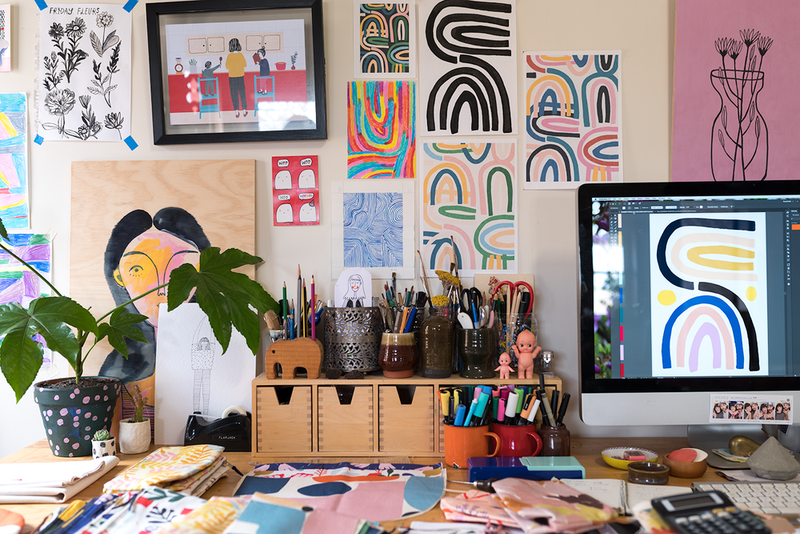 Claire Ritchie is a Melbourne-based designer/maker of bright, colourful prints, patterns and textiles. If you follow her on Instagram you'll instantly recognise her work - there are lots of florals, rainbows and great colour palettes. 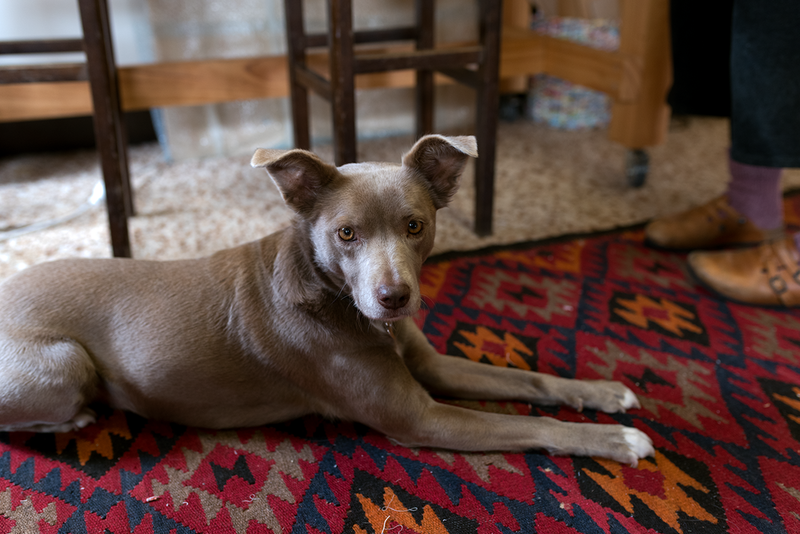 I had the pleasure of hanging out with Claire, her youngest daughter Freya and their very affectionate dog Fox for an afternoon, drinking tea and chatting. Oh yeah, and taking some photos. 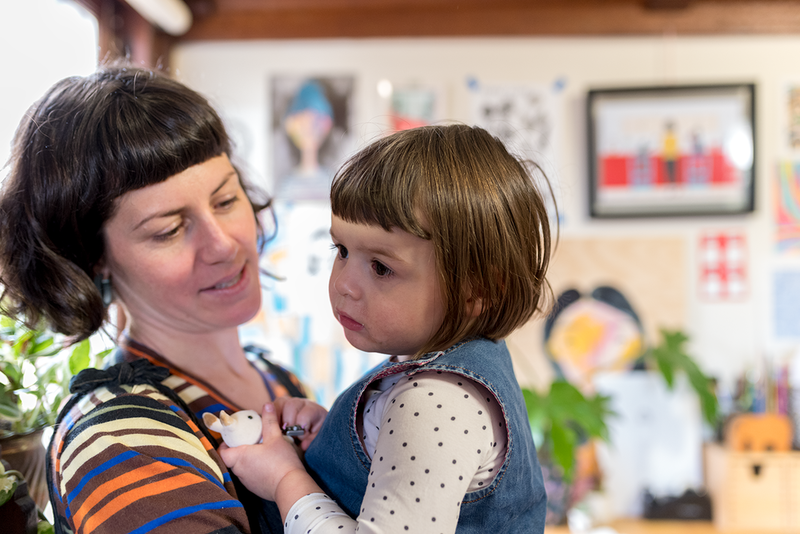 Claire is originally from Fremantle, WA and then moved to Geelong, but in the last couple of years she's been in Melbourne's inner north. 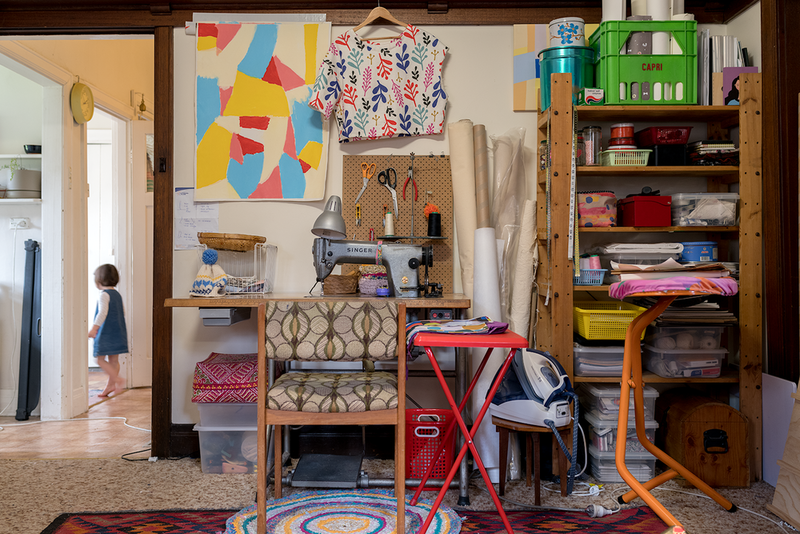 She works from her home studio, which sits in the middle of the sweet old rambling house she shares with her partner, their two daughters and Fox, the hound. 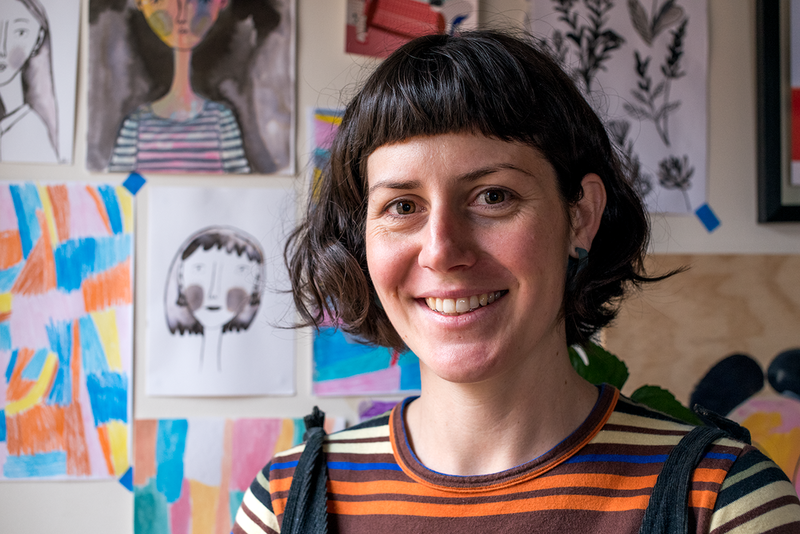 Claire's work often starts out as drawings in her sketch book and some of her hand drawn patterns are made using Posca pens - what a blast from the past for me! 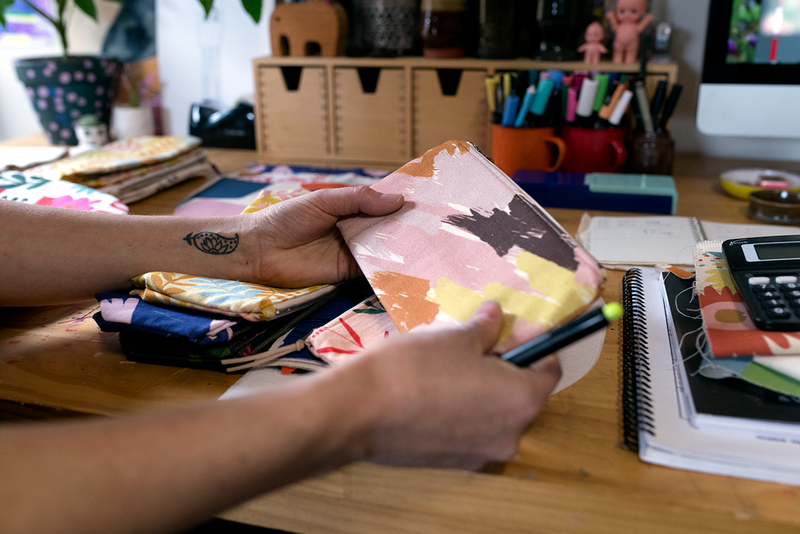 Her designs are then digitally printed onto ecofriendly, sustainable fabric which Claire sews into purses, clutches, hats and aprons. She soon plans launching a small line of clothing - you can see some samples in the photos below. Claire's mum had a big influence on her - she hand printed textiles and worked as a seamstress and sewer. She also had what Claire remembers as being a dream workspace, which I'm sure will be Claire's children's memory of this workspace. Claire's desk gets lovely natural light. Photo © Susan Fitzgerald 2017. 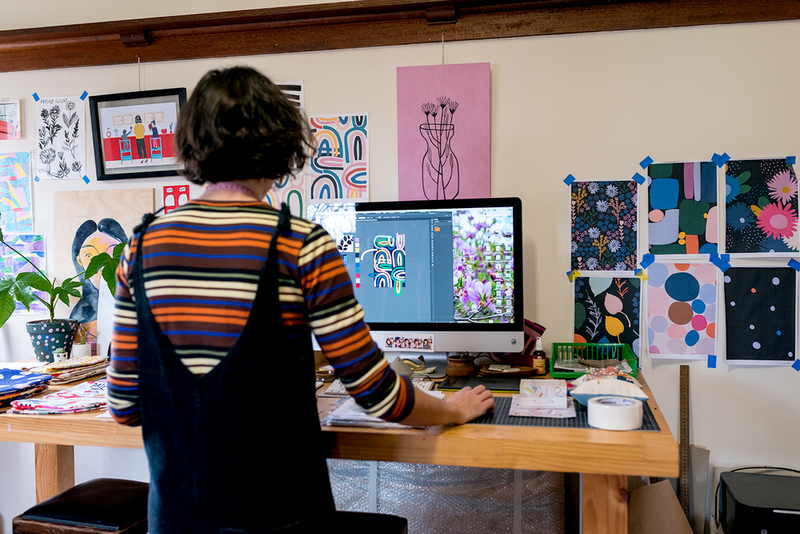 Claire at work in her studio. Photo © Susan Fitzgerald 2017. Claire's desk setup. Photo © Susan Fitzgerald 2017. Some of Claire's textiles. Photo © Susan Fitzgerald 2017. Fox. Photo © Susan Fitzgerald 2017. Samples from Claire's upcoming line of clothing. Photo © Susan Fitzgerald 2017. Claire and Freya in the studio. Photo © Susan Fitzgerald 2017. Posca! Photo © Susan Fitzgerald 2017. A pin cushion Claire made, using scraps of her fabric. And some Tsuno tampons that just arrived in the mail, with packaging designed by Andrea Shaw. Photo © Susan Fitzgerald 2017. Stacks! Photo © Susan Fitzgerald 2017. Claire in her cute kitchen, making tea! Photo © Susan Fitzgerald 2017. Claire and Freya, who got up to some mischief while we were distracted! Photo © Susan Fitzgerald 2017. How long have you been in your current workspace and where did you work from previously? I’ve been here for about a year. I was working from the tiny, freezing sunroom at the back of our house before this. Then I realised I could take over the formal dinning room! I’ve always worked from a home studio. Do you prefer working alone or with/near others? I do prefer working solo. I get so focused that I block everything and everyone out. I enjoy having people around though. It's nice to have visitors and to share my space sometimes to get a new perspective or to see how others work. You can get so used to working solo that when you do share your space you think, "Wow! This is fun!!" How many hours a week do you spend there? Ha ha, every minute I can!! No seriously I find myself floating into the studio at every opportunity. I do have two full days that I can solidly work. I have a six-year-old, Mila, and a two-year-old, Freya, so I’ve had to be smart about how I use my time. I do a lot on the weekends when my partner Dean is home. So it would probably be between about 20-30 hours depending on what's happening that week. Sometime I have to have a whole week off to spend with the girls. What's your favourite thing about the space? I love my desk! I feel like having the right desk can really change how you work. I have everything I need on it. Computer, drawing materials and I can move close to the window and get really good light or further away and work on the computer. 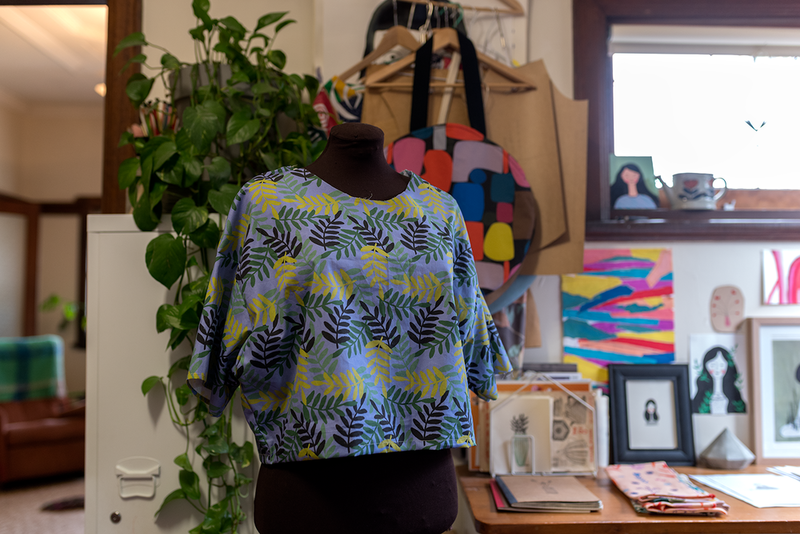 I can stand or sit, which is great for switching between computer work and then cutting up fabric and pattern making. I do love my window too, which I frequently find myself staring out of. How, if at all, has a workspace (this or previous) influenced the way you work? Having everything I need in one space definitely makes me more productive. It's also got a lot of room to spread out and have everything out where I can see it. If I can't see what I'm working on I'll forget about it! Ha! It's also warm. My last space was freezing so I didn’t want to be in there as much. What does your dream space look like? I have always wanted an old milk bar as my studio space. I would love to have a shop front with an open studio at the back. I like the idea of opening up my space for people to see. What inspires your work? (ie: the work of others, a ritual, nature, colours, dreams) Nature, big-time! Whether it's colour, texture, shape I am always the one looking out the window daydreaming or the one collecting all the leaves and flowers in a cute little basket. I get my kids to take a basket with them on our walks and I end up filling it up! I definitely feel inspired by people around me. I get really excited when I get to talk to other creatives. I feel like having a community of people around you who are like-minded can make a huge difference to your productivity. I love op shopping and vintage markets. I am really drawn to all the old vintage kitchen wares. The bright colours and pastels pop up in my work a lot. Do you have any tips for great things to do in your work hood? Walks to Merri Creek are great for getting a big gulp of fresh air. I’ll also pop out to my local op shop on Oakover Rd if I feel like I need some inspiration. And Vintage Garage is just down the road. High St. Thornbury isn’t far either and there are lots of great venues and shops to visit. Think Thornbury is a great little shop supporting local makers. I always pop in for a quick visit and then end up having awesome chats with Maggie or Josh, the owners. If I get coffee, mostly we make our own each morning but I will got to Ampersand or Short Round in Thornbury. Both venues have great plants to drool over. And on the other side of St Georges Rd in Thornbury I’ll head to Pearl Oyster. It is super chilled there and they are always smiling. Finally, music or no music when you're working, or podcasts? If so, what/which? I have to have music. Especially when I’m drawing. I love how it affects what I’m doing. I’ve been listening to Bonobo a lot lately, and I’ve also gone back to an old favourite the Whitest Boy Alive. Their Dreams Album is ace. I also discovered, earlier in the year, a Fleetwood Mac album, before the girls joined the gang, called Men of the World: The Early Years. It is incredible and I couldn’t believe I hadn’t heard it before. If you opened my music right now you would see quite the mixture of different artists. All depends on how intensely I need to work! These are some… Flume, Bowie, Hermitude, Kaytranda, Big Scary, The Pharcyde, The Knife, A Tribe Called Quest and Massive Attack. Sometimes I will get up and have a little dance if I’m feeling good. Claire and a giant Posca! Photo © Susan Fitzgerald 2017. A pattern from Claire's sketchbook. Photo © Susan Fitzgerald 2017. A floral pattern from Claire's sketchbook. Photo © Susan Fitzgerald 2017. A geometric pattern from Claire's sketchbook. Photo © Susan Fitzgerald 2017. Thanks, Claire! 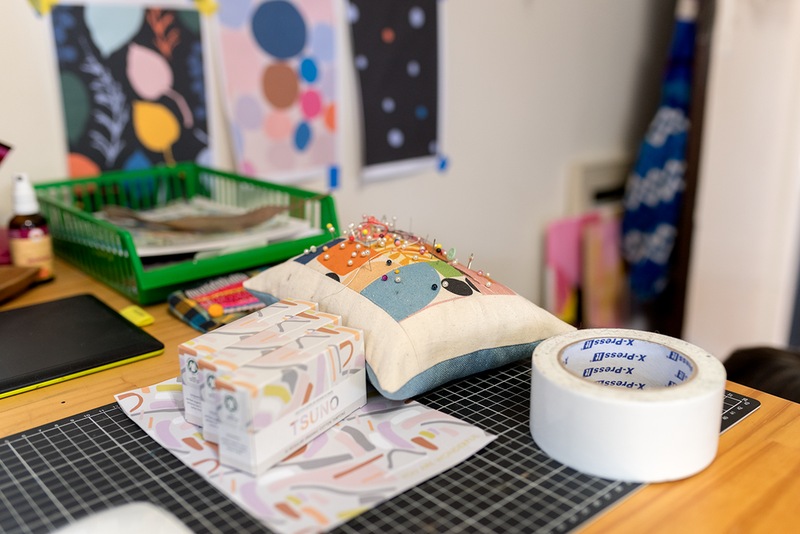 And don't forget to follow Studio Space on Instagram: @studiospace_ #hellostudiospace or sign up to the mailing list below and be the first to find out about new studio visits. Words and photos © Susan Fitzgerald.